A spread at Saha, one of the participating restaurants for Berkeley Restaurant Week. Now in its sixth year, Berkeley Restaurant Week celebrates the city’s dining scene with special prix-fixe menus for 10 days, starting Thursday, Jan. 18, and continuing through Sunday, Jan. 28. If you aren’t already privy to Lucia’s (2016 Shattuck Ave.), just know that it makes some of the best Neapolitan pizza in the East Bay. For Berkeley Restaurant Week, Lucia’s is offering a three-course dinner for $25 with a few options for each course. The main prize is pizza or handmade pasta, paired with a starter and dessert. This is also a great option for vegetarians. Where else but a tapas restaurant can you get 10 courses for $25? At La Marcha (2026 San Pablo Ave.), this special feast includes a bone marrow and clam croqueta; wild boar meatballs with sherry tomato cream; and what appears to be a fun riff on In N Out’s animal-style fries in the form of patatas bravas. 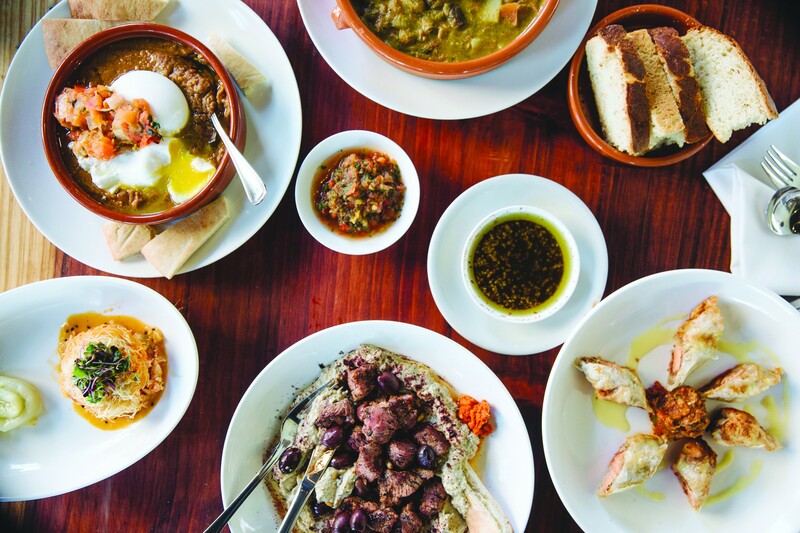 With modern Middle Eastern fare, Saha (2451 Shattuck Ave.) stands out in part for its sheer volume of choices. For appetizers and mains, for example, you have roughly a dozen items to pick from. A three-course meal will run you $35, which is a $5 or $10 savings depending on if you go with vegetarian or meat dishes. This is a particularly excellent option for vegetarian, vegan, and gluten-free diners. Elmwood’s Donato & Co. (2635 Ashby Ave.) is offering the same menu for lunch and dinner, except it’s only $20 instead of $35 at lunch. If you can make it for lunch, it’s a real steal: wild prawns with chickpea fritters on a sesame bun; risotto with beets; and a creamy, chocolate dessert with mandarin sorbet. An upscale, California-French restaurant from a Chez Panisse alumnus, Pompette (1782 Fourth St.) will showcase two different three-course menus for lunch and dinner at $20 and $35, respectively. The lunch is a particularly great opportunity to try out Pompette if you’re normally shy about its prices. It includes cauliflower soup, pasta with pork ragu, and ricotta ice cream.